Très lumineux Loft 2 niveaux, avec une chambre donnant sur le salon. Grandes plein mur des fenêtres sur les deux niveaux permettre l'entrée de la lumière du soleil et des rideaux à rouleaux pour l'ombre et de la vie privée. Petit balcon avec une belle vue et des chaises et une table pour que votre 'picada' tandis que le soleil se couche dans la ville ou utilisez votre ordinateur portable wifi équipé de trouver un bon restaurant pour le dîner, ou tout simplement le travail brut. Cuisine équipée (four traditionnel, micro-ondes, grille-pain, cafetière, etc. ), internet rapide connexion haut débit avec wi-fi, TV LCD avec toutes les chaînes du câble, de l'équipement audio (Ipod aux de connexion), DVD. Petite piscine sur le toit-terrasse et un espace bronzage. Près de la station de métro (4 blocs) et toutes les lignes de bus. Beaucoup de petits restaurants chics à proximité, typiques de ce quartier de Palermo Hollywood et très proches du quartier de la mode Soho. Salon a un canapé avec un lit simple sous-jacent qui peut être utilisé pour une personne supplémentaire. Buanderie sur toit-terrasse avec lave-linge et sèche-linge gratuitement. S'il vous plaît vérifier mes commentaires! This apartment is ideally situated, well appointed & very comfortable for the 3 of us. Three of us spent three nights in this wonderful apartment in the Palermo section of Buenos Aires. Because we were surrounded by restaurants, shops and markets, we felt we were actually living rather than just merely visiting this welcoming neighborhood and would highly recommend it to others. We stayed for just under a month and had a fantastic time exploring all of palermo. We rarely used public transport as so much was in walking distance but a major station was nearby when we needed it. The flat had everything we needed, iron, coffee machine, sound system, good Internet etc. We experienced some Buenos Aires power and water issues but Enrique was quick to respond on whatsapp and kept us updated with what was going on. He spoke excellent English and even booked us a large taxi for all of our luggage on the final day and let us check out late. Great location, and great amenities. Awesome location. Great place to stay, and I would highly recommended it to my friends, and family. I would highly recommend this 2 story - 1 bedroom apartment in Palermo Hollywood. Safe, residential area, a block away from a market and restaurants/bars. Communication with the owner Enrique was super easy and he was very responsive. The apt comes with everything you need - fridge, stove, tv, clean towels, hot shower, comfortable bed.. and a balcony with a great view of the city. Any tips you need on where to go, Enrique will provide. We rented Enrique’s apartment in Palermo for a month. This was a perfect fit for our purposes. I told my husband more than once that I could live here. Everything is within easy walking distance. Within 6 blocks of the apartment is the Palermo subway station, bus stop for many routes, at least 3 good grocery stores, several vegetable stands, 3 bakeries (think dulce de leche coconut tart), dozens of restaurants (many of the city’s top rated), top quality shopping …. Palermo is a safe upper middle class neighborhood centrally located for easy access the the tourist sights. The unit is in a secure building on a tree-lined street. The layout is great for a couple and could work for a third person on the pull-out in the sofa. The huge windows fill the unit with light, and the balcony is ideal for enjoying your beverage of choice. There’s even a rooftop deck for a more expansive view. The unit has a full bath upstairs and a powder room on the first floor. The kitchen is fully equipped – including a 4 burner cooktop and oven. The unit is clean and weekly maid service was provided. The internet was fast and reliable. Enrique was always quick to respond (in perfect English) to our questions and went out of his way to make our stay pleasant and comfortable. We could not ask for a better experience. THANK YOU, Enrique. Buenos Aires is a big city, but public transportation is great (and cheap) and will get you to all the tourist attractions. Before you go download BA Como Llego and Maps.Me (much better than Google Maps in BA -- works even offline) for easy navigating. Great place to stay in. We stayed here for a month; we visited from USA. Accurate description; everything looked as shown. Great communication with the owner at all times. 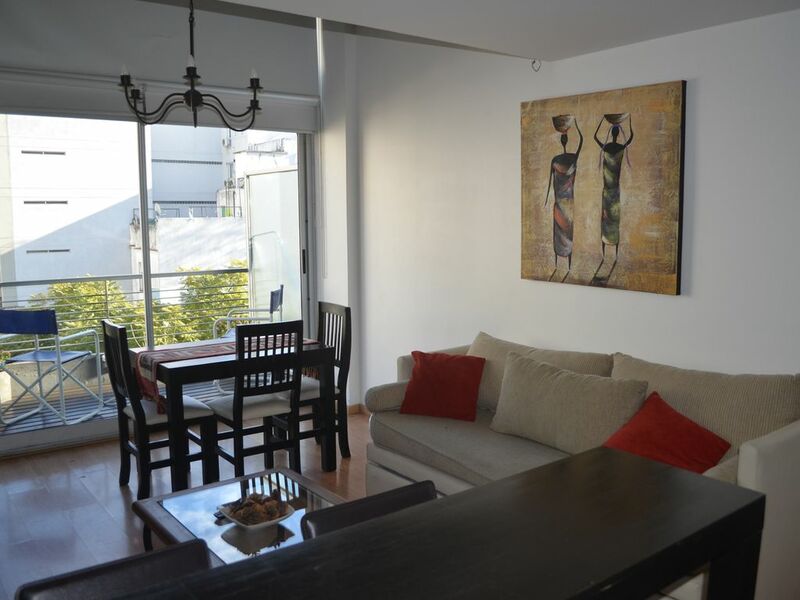 We would highly recommend this rental to anyone considering to visit Buenos Aires. We look forward to another stay here in the near future. Près de tous les restaurants pour lesquels le quartier, Palermo Holywood, est célèbre. Près de la zone de Soho avec des magasins d'une manière à la mode. À distance de marche de la station de métro (Palerme) reliant au centre-ville de Buenos Aires. Zoo et jardin botanique à proximité. Zone tranquille.